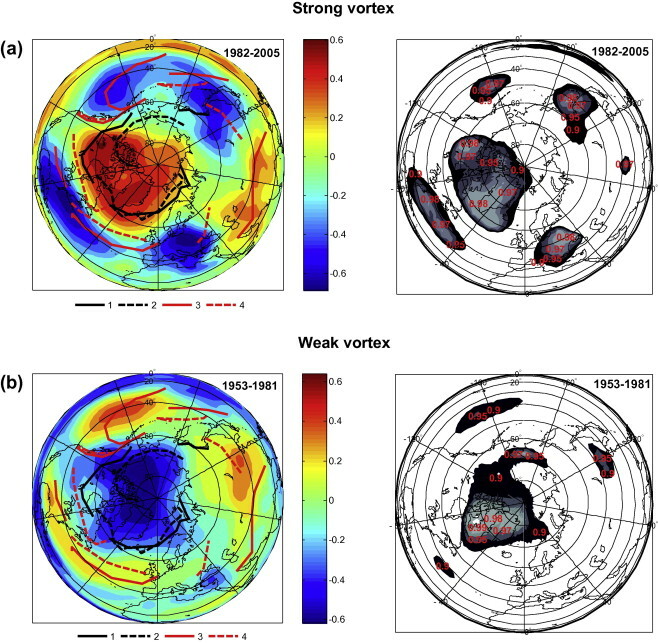 A paper published today in Advances in Space Research finds a possible reason why the effects of solar activity and galactic cosmic rays on the lower atmospheric circulation can vary over time, due to a 60-year natural cycle of the stratospheric polar vortex. According to the authors, "∼60-year oscillations of the amplitude and sign of Solar Activity/Galactic Cosmic Ray effects on the troposphere pressure ...are closely related to the state of a cyclonic vortex forming in the polar stratosphere. The intensity of the vortex was found to reveal a roughly 60-year [cycle] affecting the evolution of the large-scale atmospheric circulation and the character of Solar Activity/Galactic Cosmic Ray effects." 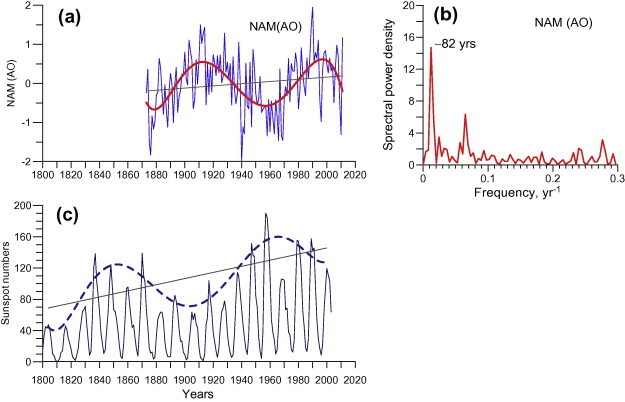 The paper is one of the first to connect the effects of solar activity and GCRs with the well-known 60-year climate cycle. Possible reasons for a temporal instability of long-term effects of solar activity (SA) and galactic cosmic ray (GCR) variations on the lower atmosphere circulation were studied. It was shown that the detected earlier ∼60-year oscillations of the amplitude and sign of Solar Activity/Galactic Cosmic Ray effects on the troposphere pressure at high and middle latitudes (Veretenenko and Ogurtsov, Adv.Space Res., 2012) are closely related to the state of a cyclonic vortex forming in the polar stratosphere. The intensity of the vortex was found to reveal a roughly 60-year periodicity affecting the evolution of the large-scale atmospheric circulation and the character of Solar Activity/Galactic Cosmic Ray effects. An intensification of both Arctic anticyclones and mid-latitudinal cyclones associated with an increase of GCR fluxes at minima of the 11-year solar cycles is observed in the epochs of a strong polar vortex. In the epochs of a weak polar vortex SA/GCR effects on the development of baric systems at middle and high latitudes were found to change the sign. The results obtained provide evidence that the mechanism of solar activity and cosmic ray influences on the lower atmosphere circulation involves changes in the evolution of the stratospheric polar vortex. Fig. 1. a) Distribution of mean monthly temperatures in the stratosphere of the Northern hemisphere at the level 20 hPa in January 2005. The asterisk shows the temperature minimum in the vortex center. 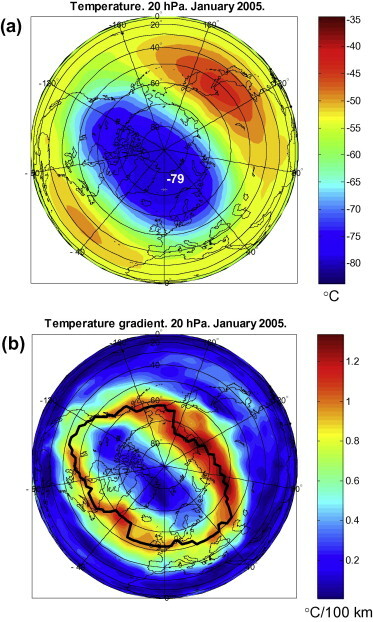 b) Distribution of magnitudes of temperature gradient at the level 20 hPa in January 2005. The black curve connects the points of the maximal value of temperature gradient at given latitude. Fig. 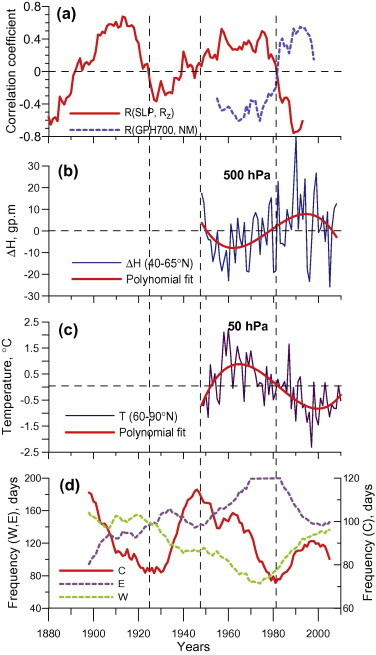 2. a) Time variations of the correlation coefficients between yearly values of troposphere pressure at high latitudes (60-85°N) and SA/GCR characteristics for 15-yr sliding intervals: solid and dashed lines show R(SLP,Rz) andR(GPH700,NM), respectively. b) Anomalies (deviations from the climatic mean) of the mean yearly difference of zonal gp heights ΔH between the latitudes 40 and 65°N for the 500 hPa level. c) Anomalies (deviations from the climatic mean) of mean yearly stratospheric temperature at the 50 hPa level in the high-latitudinal region 60-90°N. d) Annual frequencies of occurrence (number of days during a year) of the main forms of the large-scale circulation according to Vangengeim-Girs classification (15-yr running averages). The vertical dashed lines show the years of the correlation reversals. The thick lines at the panels b) and c) show the 3rd order polynomial fits of the data. Fig. 3. Distribution of the correlation coefficients R(GPH700, NM) between tropospheric pressure and GCR intensity (left) and their statistical significance (right) for the periods of a strong (a) and weak (b) polar vortex. Curves 1 and 2 indicate the climatic positions of Arctic fronts in January and July, respectively. Similarly, curves 3 and 4 indicate the climatic positions of polar fronts. The confidence levels are shown in grayscale: 0.9 (black areas), 0.95 (dark grey areas), 0.97 (grey areas), 0.98 (light grey areas) and 0.99 (white inner area). Fig. 4. a) Yearly values of the NAM/AO index (Li and Wang, 2003); b) the Fourier spectrum of the NAM/AO index; c) yearly values of sunspot numbers. Grey lines show the linear trends; thick solid (a) line shows the 6th order polynomial fit of the NAM/AO indices; dashed line (b) shows the 6th order polynomial fit of sunspot numbers in the maxima of the 11-year solar cycle. Fig. 5. a) Anomalies of sea-level pressure and surface temperature in the Arctic region, the temperature data are given according to Frolov et al. (2009). The thick lines show 15-year running averages. 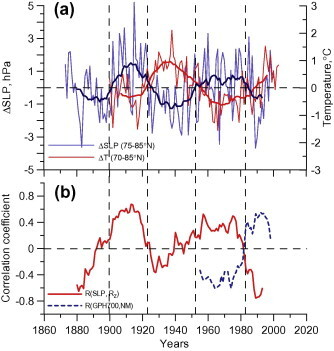 b) Time variations of the correlation coefficients between yearly values of troposphere pressure at high latitudes and SA/GCR characteristics for 15-year sliding intervals; solid and dashed lines show R(SLP,Rz) and R(GPH700,NM), respectively. Vertical dashed lines show the transitions between positive and negative phases of the Arctic Oscillation. Fig. 6. 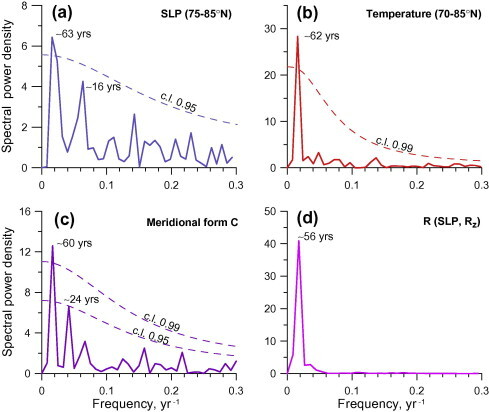 The Fourier spectra of SLP (a) and temperature (b) anomalies in the Arctic region, the frequency of occurrence of the C-type meridional circulation (c) and correlation coefficients R(SLP,Rz) between SLP at high latitudes (60-85°N) and relative sunspot numbers (d). Confidence levels are calculated for a red noise with AR(1) coefficient =0.3 (a), 0.65 (b) and 0,4 (c). The article is wrong in that it has been shown at times of solar minimum the polar vortex although more expansive is weaker. Anotherwords, at times of prolonged solar minimum activity the arctic oscillation is much more negative ,making for a much more meridional atmospheric circulation pattern.